Growing up in Salt Lake, Allan Liu and Jake Fitisemanu Jr. each have fond memories of celebrating Lunar New Year in their family homes and community. In Salt Lake, the Liu family celebrated by gathering for a big meal the weekend before or after Lunar New Year. Without having extended family nearby and due to the scarcity of seasonal items and Asian markets in Salt Lake in the 1980s and ’90s, Liu says their celebrations were simple. Because Lunar New Year isn’t recognized as a state or federal holiday, it was business as usual for them in terms of work and school. Meanwhile, for family members living in Hong Kong and China, Liu says that Lunar New Year was a weeklong holiday from school and work and can be thought of as Thanksgiving, Christmas and New Year’s all rolled up into one. If they didn’t have a potluck at his parent’s home, Fitisemanu recalls celebrating Lunar New Year at restaurants like Ho Ho Gourmet or Cafe Anh Hong. His grandparents’ ethnic Hakka and Cantonese recipes remind him most of Lunar New Year. Fitisemanu’s grandmother taught him that a Lunar New Year celebration must include at least four dishes: one “stuffed,” one noodle, one pork and one chicken. Noodles should not be cut as they represent long life. Pork is served because when pigs eat, they push forward with their snout, representing pushing success in the previous year forward into the new year. Chicken is served because chickens scratch backward, symbolic of pushing back bad luck from the previous year; stuffed foods (stuffed tofu, duck and dumplings) represents filling the New Year with prosperity and luck. In addition to the celebratory foods of Lunar New Year, both men relish certain family traditions. 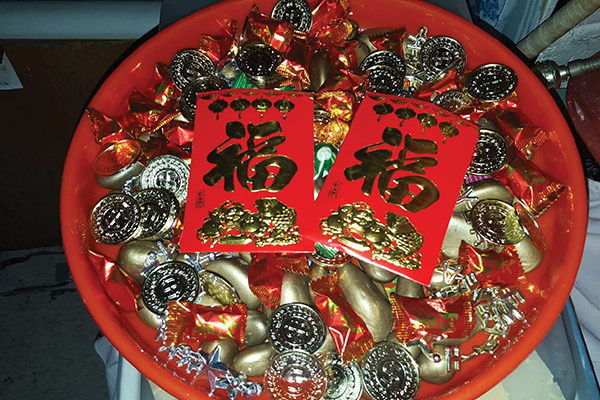 For instance, Liu recalls greeting parents and grandparents with New Year phrases of “Gung hay fat choy!” and “Sun lin fai lok!” to receive a lucky red envelope. Now, for him, Lunar New Year is about passing red envelopes to nieces and nephews. Fitisemanu cherishes setting up the memorial altar with his daughters and feeling grief for the departed and the joy of honoring their memory. One cultural activity that both Liu and Fitisemanu enjoy is their participation in the Jung Hing Lion Dance Club. 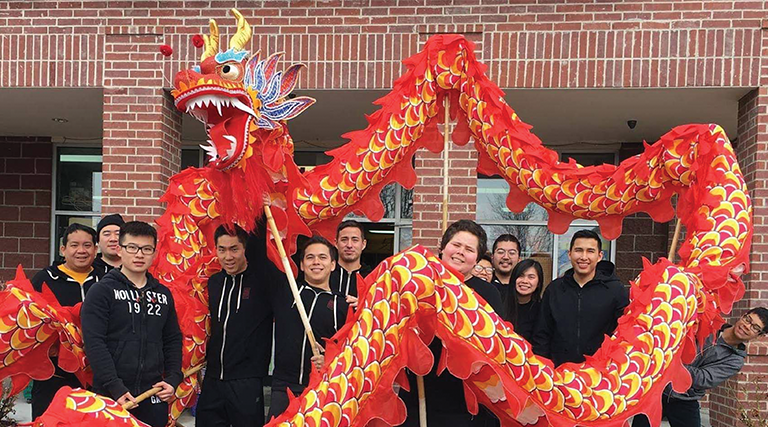 To this day, they remain active in the club, the oldest lion dance troupe in the Intermountain West. 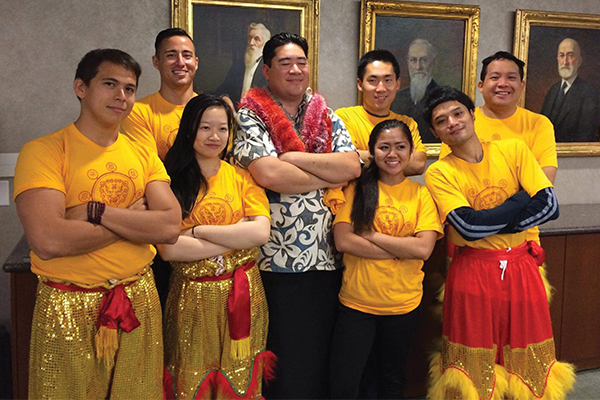 Fitisemanu is the club’s head coach teaching Chinese American youth the art and cultural practices of traditional Futsan-style lion dance and dragon dance, including Cantonese drumming. During the two-week Lunar New Year festivities, the dance troupe perform lion dance blessings for local restaurants, businesses and grocery stores. 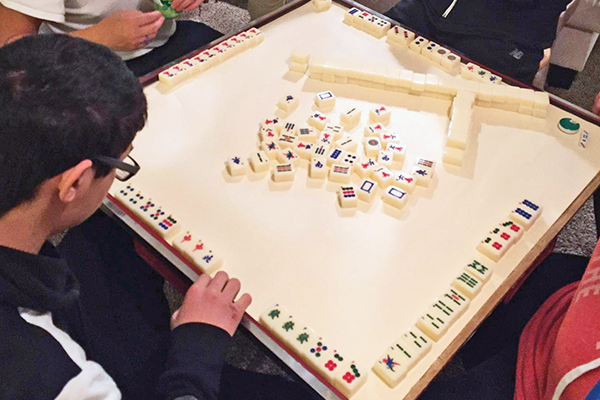 In addition to lion and dragon dancing throughout the community, each year, the club celebrates Lunar New Year with a potluck Chinese dinner, firecrackers and mahjong at Fitisemanu’s house.